Seem to remember Ted Mack doing TV commercials for this, pronouncing it "Geh-i-tol." A few years ago it was reformulated. For at least 30 years it's been prescribed to pregnant women to build up their iron. I had a college health sciences professor who said it made people feel better because of the high alcohol content! You won't see this tonic anymore. It contained too much iron. Old folks really don't need that much iron. Growing up, I made fun of folks who used Geritol tonic--now, I'm getting close to the age where it isn't funny anymore. 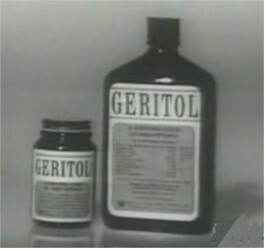 I seem to remember Geritol being sponsors of Ted Mack's Amateur Hour and The Lawrence Welk Show. Those two might have benefited from the lift that Geritol was supposed to give you, especially Ted Mack- he was about as low-keyed as you can get and still be awake. This product made a slick promoter named "Colonel" Tom Parker a rich man. It was not much more than snake oil. Parker went from this to Elvis Presley, with whom he REALLY became rich, and that time, he had the REAL thing! Lol! another thing I forgot about. We never had any but I remember the commercial on T.V. and everytime we joked about someone "getting old" we would refer to them taking "Geritol!" Do they still make that stuff?